Pasta pot including pasta insert with boil-over protection. Wide pouring edge for drip-free pouring. Made in Germany - Premium quality, produced in-house in Germany. 30-Year warranty for the inner and outer ceramic Silargan surface with intended use. Mediterranean design with trending colours and brilliant visual appeal. As versatile as they are popular: our deep casserole pans are ideal for cooking anything that requires plenty of liquid. And since the rim is especially high, no fat splashes over when frying meat. Pasta, potatoes and dumplings can easily be added to any dish and ample space is provided for blanching large vegetables such as cauliflower. Boiled potatoes are also easily mashed directly in the pan. The scale on the inside of the pans facilitates the measuring of liquids. Stay-cool handles, a steam vent in the lid and a wide pouring rim make handling even easier. The deep casserole pans have a TransTherm® universal base for even heat distribution and long-lasting heat retention. They are available in various sizes ranging from 12 to 24 centimetres in diameter for single-person to family households. Practical: the deep casserole pans feature in all WMF pan sets. Cooking with a high casserole – thank WMF for more variety in your kitchen! Our high casseroles with their raised edges give you fantastic results every time with all sorts of food, from fried or stewed meat to pasta and rice to vegetables. WMF high casseroles give your kitchen a bit of variety! WMF brings a sense of German order to your kitchen! Meat and hearty stews are at the core of the typical German diet. If you use the wrong pan however, everything can go awry quite quickly. Fat and juices spitting all over the work surface, and before you know it clearing up after the meal can take longer than the stewing itself. The high casserole puts an end to all that. Thanks to its raised edges everything remains clean and at the same time the searing and stewing results are enhanced! WMF high casseroles are of course not only designed for preparing tasty meat and stews. The 10 to 13 cm high edges make them the ideal choice for preparing food with a high volume of liquid, such as soup, pasta or vegetables. The high edges mean you can mash potatoes or purée a vegetable soup inside the pot without it spilling out over the top. You can choose your high casserole in various diameters between 12 and 28 cm, so that you have the right size for what you want to cook. When choosing, take into account what size hob you will be cooking on. The high casseroles also vary greatly in volume. Whereas the smaller WMF high casseroles with a capacity of 1 litre are suitable for single-person households or for cooking smaller portions, those with more mouths to feed will prefer the versions with a volume of at least 6 litres. Models with a volume of between 2 and 4.2 litres are ideally suited for average use – these are often a mainstay of our cookware sets. We would recommend that you buy a range of different sizes. If your meal consists of various elements like meat, vegetables and rice, you will need several models in different sizes at the same time.  You will only get the best quality from WMF. The vast majority of our pots and frying pans are made from our unique Cromargan® stainless steel 18/10, which is especially long lasting and easy to care for thanks to its special alloy of chrome, nickel and steel. Many of them are equipped with the patented TransTherm® universal base, which means the high casseroles can be used on all hob types, including induction. The aluminium core contained inside serves as a conductor and distributes the heat evenly to the whole pot. With WMF's carefully designed high casseroles you can cook like a professional and get excellent results in the kitchen every time. Give it a try and get to know our assortment of high-quality cookware!